In John’s gospel, Jesus rarely does anything that does not point to something else. He rarely says anything that does not contain a mysterious truth you’ll miss if you take him literally. And no one does anything to him that he does not first sense or foresee and, for some greater good or glory, permit. In John’s gospel, Jesus is aware, in charge, and everything is shot through with second meaning. And now John wants us to know that even on the cross, Jesus is still in serene possession of himself. The evangelist is quick to editorialize. You need to understand—Jesus said this so that the scriptures would be fulfilled. Which ones? John doesn’t say. For my thirst they gave me vinegar to drink. and my tongue sticks to my jaws. parched, lifeless, and without water. John’s Jesus is not so self-possessed as to be a stranger to thirst. He has his own. And he always noticed other people’s. His first sign was performed on behalf of wedding guests who had made short work of the wine provided by their host. Some thirsts surprise even the most careful providers, and Jesus, seeing what sort of drink was needed, laid in a supply that was more than anyone could have asked for. And he gave it to guests who were unworthy of it, who by the time they took their first taste of it probably could not even tell the difference. He was always doing things like that. John tells us that on the last day of the festival of Booths, he loudly invited “anyone who is thirsty” to drink his living water. Now, no one who ever lived has not thirsted for that kind of refreshment. So that’s a lot of water to give away. It could drain you, it could dry you up. So you have to wonder whether Jesus’ cry on the cross had something to do with the effects of a life-long giveaway – maybe all the water he had in his soul, all the refreshment that was reservoired in his flesh and bone, in his every healing gesture and merciful word – the deep divine wells of worth and mercy he drew upon – maybe it was almost all used up, the last little eddy of it exhausted by some parched person, maybe even an enemy. Yes, it was surely an enemy who got the last drop. Maybe the gauge had been dropping fast long before he was hoisted onto the tree. Remember that just three weeks ago in the liturgy, we read a story about thirst and emptiness and water. 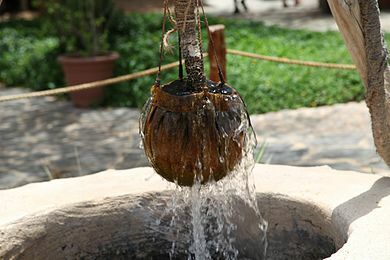 Jesus, thirsty in the noonday sun, goes into enemy territory, sits down at Jacob’s well and asks a woman for a drink. They start a conversation – John’s favorite kind, full of irony and revelation — until finally he gives her water, even though he has no bucket and the well is deep. But through all that conversation and the dashing into town and back again that follows it, I can’t find it said anywhere that the hot Jesus ever got the drink he came for in the first place. And he really needed that drink. Maybe this is what lies behind Jesus’ cry from the cross – that drink he really needed and never got. Maybe a drink of water, plain and simple, is all he’s ever wanted. Maybe it’s all he wants even now, all he will ever desire – and maybe one of us, maybe all of us together, maybe his church should be always intent on this task–to offer a drink he never got to this dried-up, dying scarecrow with a thirst so strong it compelled him past the age-old gates of fear into death itself. But it’s a lie! The perverse mystery of divine love is such that the church, sins and all, is a bottomless cistern that throughout the centuries collects endless oceans in our depths: the water that buoyed Jesus in his mother’s womb; the water John the Baptist poured over God’s beloved one; that water that by wedding’s end was very good wine; water dying down, rebuked from the swamped stern of a fishing boat; water firm like a road you walk on toward your frightened friends; the water of a woman’s tears falling on the teacher’s feet; tears falling from Jesus’ own eyes, weeping over the city, weeping, too, for Lazarus, who died; water in the basin: Jesus the slave at the feet of his friends; baptismal waters of old death and fresh life; outpoured water of ecstasy and delight, Holy Spirit, cool and abundant. Even today, even here, even now the fountain is flowing, the water sweet. There is refreshment for everyone and for all time, and to spare. “I am thirsty,” he cries to us. If today’s commemoration is about anything, it is about these two things: immense suffering and inexhaustible compassion. It is about, therefore, the call to refresh our good Friend and every bleeding scarecrow hung on trees, to be on the lookout for the lifeless, to be ready and able to give Jesus the drink he never stops needing from deep unending wells of worth and joy. “Who is Jesus Christ?” the world always demands to know. So many answers have been given, but today just one is true: he is a thirsty man. “What is the Christian community good for?” the desperate and the dying always have a right to know. Well, when all else about us is said and done, the answer is something like this: the church is good for insisting against the evidence that there is always water. That there is enough for all. That it is free. Will you pledge today to be a witness to this truth? To tell this story? And when all the wells of the world go dry, will you dig a new one, will you tap into that ancient one, will you wring a precious drop from your own human heart and say to the land, to the nations, to the suffering blood and bone of your neighbor, “Here, good Jesus, brother mine, here is the best water; good Jesus, friend of my heart, take it! Take and drink”? This entry was posted in Lent and Holy Week on March 22, 2014 by sicutlocutusest. Who Is the God Who Wants Me to Do It? good times, bad times - give me some of that: blogging on faith and life.